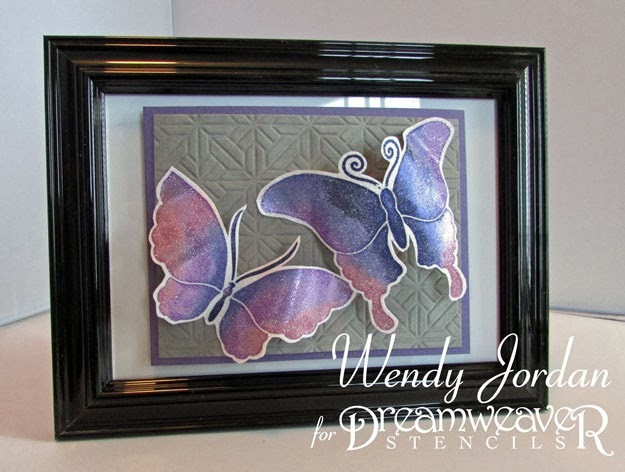 Paper Therapy: Dreamweaver Stencils February Flutters Challenge!! 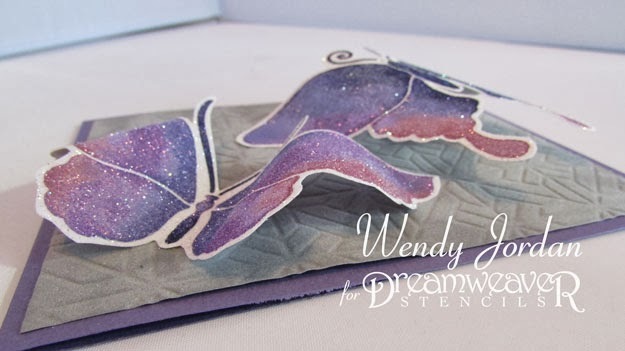 Dreamweaver Stencils February Flutters Challenge!! 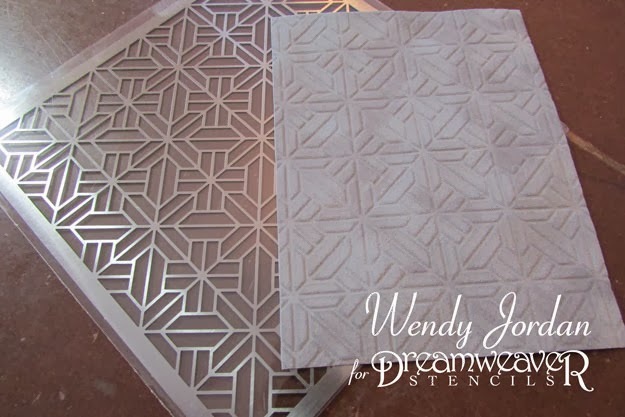 Welcome to Dreamweaver Stencils February Flutter Challenge!! This month the team is creating with anything that flutters. Today I chose butterflies because I AM READY FOR SPRING. We have about 10 feet of snow here in Western Montana and I am ready for some window open weather!! I can't believe that I haven't tried this before, but today I used stencils with velvet paper in my die cutting machine. I LOVE THE RESULTS!!! I dry embossed the velvet paper with same way that I would have embossed regular paper. My "embossing sandwich" is multi layer platform, stencil, paper, rubber embossing mat, TWO acrylic cutting plates. I put the TWO cutting mats on last, so that I don't accidentally bend my stencil. Here is a step by step video tutorial using the Double Glitter Technique. When I was done with the Double Glitter Technique, I cut my designs out and adhered them to my background in a 3D manner. Obviously I wouldn't be able to mail this card in a traditional envelope, it could be mailed in one of those pizza box mailers, if you know what I am talking about. I decided I was so happy with my creation, I put a frame behind it and placed in on my shelf in my craft studio/office. I never make things for myself and all day I have been looking at this and love it more and more!! Are you ready for some more Fluttering inspiration??? 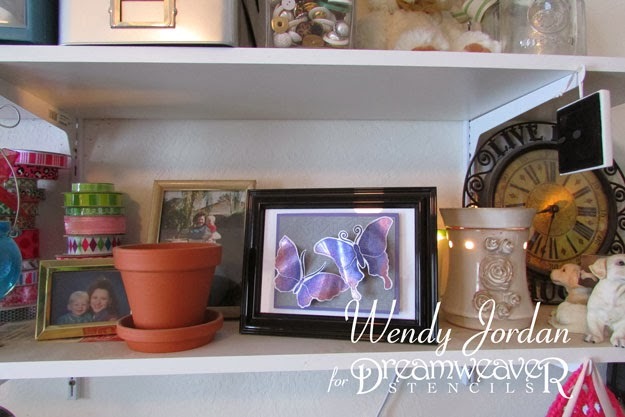 Flutter over to your crafty stash and make a "fluttering" creation. Link it to Dream It Up Blog for your change to win! See you there!! Beautiful dimension Wendy! Love the picture frame display. What a gorgeous creation, Wendy! 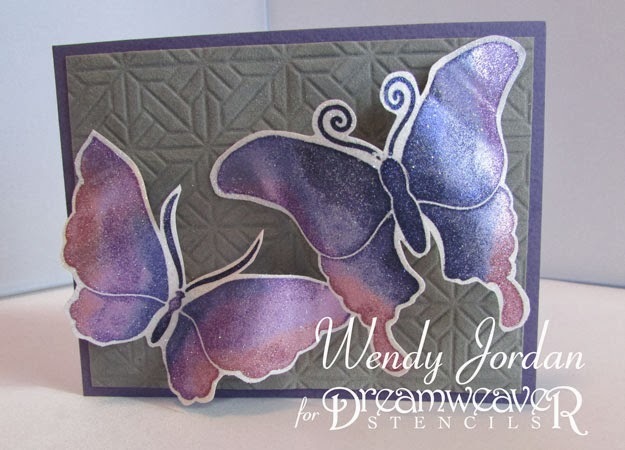 Love the dry embossing on the velvet paper (have to remember that), and your beautiful butterflies! I need to remember that you have a double glitter tutorial if I need to reference in a post. Butterflies are my favorite card images. This was an awesome technique done by you. WOW, great creation Wendy! It must have such texture in person between the velvet paper and the glitter. It would make me happy to look at it throughout the day too! We only have about 2 feet of snow, but enough already! Gorgeous piece of artwork Wendy. Love to see people using their materials and stencil tools, thanks for the inspiration! Quietfire Designs Queen of Hearts Blog HOP!! !